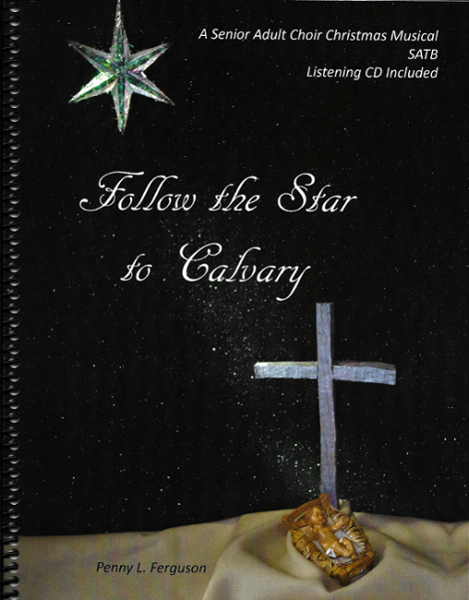 Follow the Star to Calvary contains 9 original gospel Christmas songs with sheet music, guitar chords and SATB parts, Scripture readings and a drama. The drama focuses on Dave, a Christian and a wood-carver, who has invited his unsaved co-worker, Wendell, to his workshop. Dave has been looking for an opening to share the gospel with Wendell, who is interested in becoming involved with woodcarving. At the workshop, Wendell is intrigued by a project Dave has been working on–a nativity set. As he examines Dave’s work and asks about the carved figures, the gospel unfolds. Each 140 page, coil-bound book contains a Listening CD (in sleeve inside back cover). Approximate performance time is 50 minutes. Tack Accompaniment CD is available below. Shipping prices vary beyond 1 item. Contact us for shipping info on multiple items. Artists wishing to purchase individual tracks or sheet music for performance can click here to go to our Tracks and Sheet Music page.